I've adored The Neo-Futurists since I first discovered them during their Live Bait Theatre days in the early 90's. My teenage son and I will be out for the press opening of A Story Told in Seven Fights on 3/5, so check back soon for my full review. We're looking forward to this one! 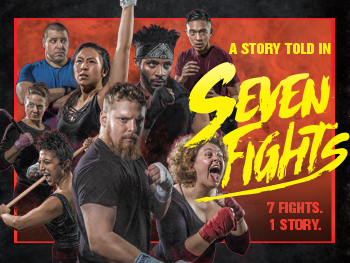 The Neo-Futurists present Ensemble Member Trevor Dawkins’ A Story Told in Seven Fights, directed by Tony Santiago, playing at 5153 N. Ashland Ave., March 1 – April 7. Previews are Thursday, March 1 – Saturday, March 3 at 7:30 p.m., with opening night Monday, March 5 at 7:30 p.m. Performances run Thursdays – Saturdays at 7:30 p.m. Ticket prices for previews and Thursdays are pay-what-you-can; for the regular run, tickets are $10-25. Tickets and information are available at neofuturists.org or 773.275.5255. A Story Told in Seven Fights finds Creator and Neo-Futurist Ensemble Member Trevor Dawkins leading a group of stage combatants smashing their way through the true stories of fist fights and theater riots that erupted within the Dadaist and Surrealist movements at the turn of the 20th century. This will be Dawkins’ second full-length Prime Time production after his 2014 summer blockbuster Haymaker and the Neo-Futurist debut for former Oracle Productions’ Tony Santiago. "When thinking about art and its role in society today, the ensemble and I wanted to look at, celebrate and scrutinize the actions of icons from the early modern art movements,” says Dawkins. “By looking at the provocations and conflicts of the past, we hope to create a strategy to fight for the future. " A Story Told in Seven Fights features performances from Trevor Dawkins*, Jen Ellison**, Rasell Holt, Arti Ishak, TJ Medel, Kendra Miller, Stephanie Shum and Jeff Trainor. A Story Told in Seven Fights’ production team consists of Tony Santiago (director), Olivia Wallace (stage manager), Gaby Labotka (fight director), Alon Stotter (lighting designer), Eleanor Kahn (scenic designer), Steve Labedz (sound designer) and Kate Hardiman (production manager). Trevor Dawkins has worked as a Neo-Futurist Ensemble Member since 2011, where he has written and performed for Too Much Light Makes The Baby Go Blind and more recently the late-night hit, The Infinite Wrench. Dawkins also created and performed in Haymaker, which The Chicago Tribune’s "On the Fringe" column listed as one of "The Best of 2014." Other Neo-Futurist Prime Time credits include Chalk and Saltwater: The Ladder Project, Daredevils Hamlet, Analog and Redletter. He has performed original work around Chicago, across the United States and at the Edinburgh International Festival Fringe. He has appeared in the films Operator and Bite Radius, as well as the Netflix series Easy. Dawkins is a graduate of Virginia Commonwealth University with a B.F.A. in Performance. Tony Santiago moved from Virginia in 2008 and works in Chicago as an artist, educator and producer. Santiago worked at Oracle Productions programming award-winning theatre available to the public free of admission. Credits include Kasey Foster’s Romulus, Red Theatre’s R+J The Vineyard, Monty Cole’s The Hairy Ape, Kristiana Rae Colón’s good friday and Joe Varisco’s QUEER, ILL, & OKAY. He directed A Chorus of Hope, commissioned by the Lyric Opera in collaboration with Chicago Voices and Harmony, Hope and Healing in 2016. Santiago is the executive producer of a pop-up production company, The Roustabouts. Roustabouts credits include, Winehouse: A Tribute to Amy, and Ike Holter’s Stay Lit and Put Your House In Order. Currently, he is a program manager at Chicago Arts Access, a nonprofit dedicated to building and connecting audiences with free tickets and accessibility services with its website, freetix.org. Previews: Thursday, March 1 – Saturday, March 3 at 7:30 p.m. Opening Night: Monday, March 5 at 7:30 p.m. The Neo-Futurists present Ensemble Member Trevor Dawkins’ A Story Told in Seven Fights, directed by Tony Santiago, playing at 5153 N. Ashland Ave., March 1 – April 7. Previews are Thursday, March 1 – Saturday, March 3 at 7:30 p.m., with opening night Monday, March 5 at 7:30 p.m. The running time is currently 80 minutes. Performances run Thursdays – Saturdays at 7:30 p.m. Ticket prices for previews and Thursdays are pay-what-you-can; for the regular run, tickets are $10-25. Tickets and information are available at neofuturists.org or 773.275.5255. The Neo-Futurists are partially supported by grants from Alphawood Foundation Chicago, The Chicago Community Foundation, a CityArts Grant from the City of Chicago Department of Cultural Affairs & Special Events, Gaylord and Dorothy Donnelley Foundation, the Illinois Arts Council Agency, and The MacArthur Fund for Arts and Culture at The Richard H. Driehaus Foundation.